The General Services Administration has announced its 2014 list of green building technologies it will evaluate for possible use in federal buildings across the U.S., and is looking for more innovations for the coming year. Nine technologies were chosen as a part of the Green Proving Ground program, whose goal is to improve the energy performance of federal buildings. GSA selects green technologies to use in U.S. federal building through the Green Proving Ground program. According to GSA, the Green Proving Ground program currently has 26 technology evaluations in the works, with 15 published results to date. In addition to the 2014 list of technologies that will be evaluated, GSA also issued its 2015 Request for Information seeking even more green technologies for evaluation in federal buildings. The deadline for the RFI is Nov. 7. It was highlighted at a White House event last week, according to Kevin Powell, Green Proving Ground Program Manager for the Public Buildings Service. The potential to provide, through a real-world M&V performance study, evidence-based information needed to support decision-making on deployment. Virtual energy audit software that analyzes building operations and existing equipment to prioritize energy conservation measures tailored to specific buildings or to a portfolio of like buildings. Using LED retrofits for lighting is just one of the technologies being used in the Green Proving Ground program. 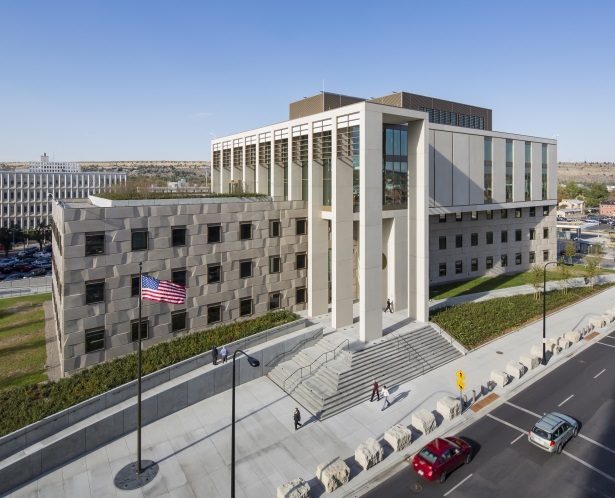 The program uses a national building portfolio as a way to “drive environmental performance in federal buildings and lead market transformation through early adoption and deployment of innovative, transformational building technologies,” according Powell. Electrochromic (EC) windows: Introduces the capability for auto-tinting windows to learn from occupancy patterns and individual preferences to improve user satisfaction and environmental quality. The host site is in Portland, OR, and the technology provider is View, Inc.
Low-emissivity window film: A film that makes it possible to achieve low-e glazing characteristics without full window replacement. The host sites for this project are in Dallas, TX, and Ogden, UT, and the technology provider is Eastman Chemical. LED replacement lamp for CFL: A “plug-and-play” replacement for 4-pin CFLs commonly used in commercial downlights is estimated to achieve up to 50 percent savings in energy consumption with minimal installation cost. The host sites for this project are in Philadelphia, PA; Dallas, TX; and Auburn, WA. The technology provider is Lunera Lighting, Inc. LED retrofits for fluorescent luminaires: Two models of LED retrofit kits for T8 and T12 fluorescent lamps will be evaluated for their ability to save lighting energy without alterations to the existing ceiling grid. The host sites for this project are in Philadelphia, PA; Dallas, TX; and Auburn, WA. The technology providers are Cree, Inc. and NEXT Lighting Corporation. Networked lighting: This lighting system enables two-way communication between LED luminaires, sensors and back-end software to achieve both energy savings and operational improvement. The host site is in Portland, OR, and the technology provider is Philips Lighting. Variable-speed screw chiller: This chiller adapts variable-speed technology typically found in larger systems to a smaller, modular footprint. The host site is in Washington, D.C., and the technology provider is Carrier Corporation. Passive thermal energy storage platform: This HVAC optimization tool leverages the physical structure and contents of large commercial buildings to store thermal energy and reduce peak energy use. The host sites for this project are in Chicago, IL, and Houston, TX. The technology provider is QCoeffcient, Inc.
Predictive energy use optimization: This cloud-based software layers weather and building use data on top of existing building automation systems to optimize HVAC operational strategies per each 24-hour period. This evaluation will be conducted as a joint effort with the Department of Energy. The host sites for this project are in Jacksonville, FL, and Dayton, OH. The technology provider is BuildingIQ, Inc. Virtual energy audit: This software analyzes building operations and existing equipment to prioritize energy conservation measures tailored to specific buildings or to a portfolio of like buildings. The host site is in Denver, CO, and the technology provider is Automated Logic Corporation.